You've never seen your carpeting so clean. Use of Mothers® Carpet & Upholstery Cleaner is an eye-opening affair, revealing the true color and character of your interior. Our Carpet & Upholstery Cleaner is tough enough to pull out the stubborn stains and marks that mar your vinyl, velour, cloth, carpet and sheepskin, while being pH balanced and environmentally safe. 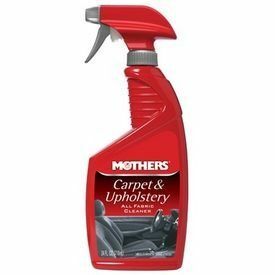 Not just for cars, Mothers® Carpet & Upholstery cleaner works on stains in the home too, and the big 24-oz. non-aerosol bottle gives you plenty for all those jobs.